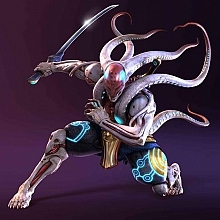 Just looks like devli jin is sucking the demon outside his sword or something. o_O? It was hard trying not to blink for so long but, yey!!! I saw him!!! And OMG this game looks amazing... I cant wait. Thanks for posting Haru!!! That´s nice ^^ There might be a Steve vs Craig story too...referring to the T5 ending of him....or Steve vs Hwoarang ? Just why won´t they make Kazuya as devil playable again -.-"
wow, it will be released on october, right?? Yeah, bryan vs paul was like a strange battle but intesresting by the way. QUESTION, is yoshi's vid connected to Devil Jin's vid? ANYWAY, if devil jin is somewhat stealing/leeching the power of yoshi's sword in the vid, would that be the cause why yoshi's sword loses power? Also, would that result into a rivalry : YOSHIMITSU VERSUS DEVIL JIN : which would be a bit cool... And, will Yoshimitsu be the one who'll stop Devil Jin?